In case you haven’t noticed, February is the month of love. 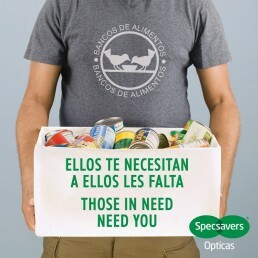 But it you are all Valentine’d out by now (and let’s face it, who isn’t) optical chain Specsavers Opticas are asking people to show their love for the most disadvantaged in their community by making a small food donation this month. They are collecting non-perishable food for the Spanish Federation of Food Banks in all of their stores on the Costa del Sol, Costa Blanca and Mallorca throughout the month, which will then be donated to the local food bank in their province. The Costa del Sol’s Food Bank is Bancosol, a non-profit organisation founded in 1998. Since then it has been growing and changing to adapt to the constantly increasing number of people who need them and provide as much as they possibly can. In 2016 they distributed 6 million kilos of food to 50,000 disadvantaged people in the Malaga province. Currently, as well as distributing food, they are running a project to help beneficiaries of food donations into training and internships in order to aid these vulnerable people to find work. In order to meet the growing need for assistance, they require donations from individuals, organisations and companies and Specsavers Opticas has taken up the challenge to make a difference this February. From February 1 – 28 anyone can drop off their food at their local store during opening hours. At the end of the month it will be donated to Bancosol Food Bank, for them to distribute in the community via partnerships with local charitable organisations. Bancosol are particularly in need of oil, tinned fish, preserved meat and meals in a can such as soups and stews.